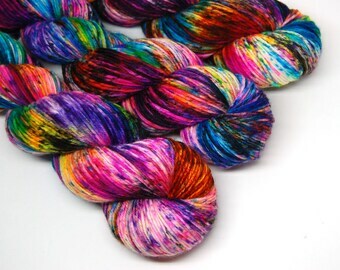 handpainted yarn and fiber in a rainbow of colors! Announcement Official shop updates and sales are announced on Instagram, so check there for the latest news!! Some items are restocked as needed during the week though, so check back often if the item you want is out of stock! Official shop updates and sales are announced on Instagram, so check there for the latest news!! Some items are restocked as needed during the week though, so check back often if the item you want is out of stock! This yarn is so unique and beautiful and definitely satisfies my color love! Ill be ordering again and again! Thank YOUUU!! Very pretty! Love the swirls of color!!! Amazing depth of color!!! Completely amazing!!!!! One of my favorite colorways EVER. Hands down drop dead GORGEOUS YARN!!!!! The name says it all.....FUN!!!! Looooove this! I really hope this colorway stays around for a long long time. Truly vibrant and gorgeous!!! Back in 2008 I stumbled upon hand dyed yarn and fiber on Etsy while browsing and fell in love. I was so intrigued by the gorgeous color blends that I decided to try dyeing myself. I found that I had a great eye for creating colors and that I had an amazingly fun time with it. The rest is history! These days I mostly focus on speckle dyed yarns, which are my personal fave to dye, photograph and knit! I've been dyeing, spinning and knitting for 9 years and started my little shop when I was laid off from the corporate world. I haven't looked back since! I enjoy bright and sparkly things and making people smile with them. Please contact me within 3 days to discuss a possible refund. All situations are handled on a case by case basis. Items must be in new shape. Buyer will pay for return shipping and will be given a refund minus their original shipping cost. If the buyer receives an incorrect item, shipping will be paid by seller. If you purchase the wrong item, or change your mind please contact me immediately. Cancellations will not be accepted after the item has been shipped. Payment must be received within 24 hours of purchase or seller will be contacted. If payment is still not received, the sale will be canceled. Coupons/promotions do not apply to custom orders or club memberships. All packages are shipped within 3 business days of purchase (generally faster!) unless they are clearly marked otherwise (such as MADE TO ORDER). Shipping generally doesn't occur on Saturdays or Sundays. Please wait at least 24 hours before tracking your package, as the post office does not always scan them in immediately. If there is ever an unusual delay in my shipping, I will contact you to let you know. If you need something faster than 3 business days from purchase, please indicate this in the "note to seller" section and I will try my best to accommodate you! If you purchase 4 full sized skeins, or 5 total items or more, your package will ship Priority mail within the US. I insure all US packages worth over $100. All items come from a smoke free, cat-friendly home! If you are allergic to cats, you may want to shop somewhere cat free. All items are rinsed in lightly scented wool wash. While I try not to use stock photos all the time, I do use them sometimes. I try to make sure that the item you receive is very similar to the photo from your listing. Due to the nature of handmade/handdyed products every single item is unique. Please remember that colors vary from monitor to monitor and camera to camera. No custom orders will be accepted at this time.